Whether or not children should strength train has long been a debated topic in fitness and parenting circles. Some claim it’s healthy and natural for children to engage in strength training, while others insist children’s bones and connective tissues are not ready to bear weight in that way, and that weight lifting stunts children’s growth. Others may even envision child bodybuilders deprived of a normal childhood, sadly exploited by their parents for attention and financial gain. These negative ideas of children’s strength training are based on erroneous principles and fitness myths, and need to be laid to rest once and for all. Continue reading to find out why strength training for kids is safe and effective, how to structure strength training workouts for kids, specific guidelines for kids’ strength training programs, where to find strength training programs for kids, and sample strength training exercises that are great for kids and adults alike. You may be surprised to learn that the National Academy of Sports Medicine (NASM), the American Council on Exercise (ACE), the National Strength and Condition Association (NSCA) and other authoritative sources fully endorse strength training for kids. If you think about it, weight training for kids makes intuitive sense. Kids are naturally drawn to weight-bearing exercise (and often perform it much more vigorously than adults): sprinting, jumping, monkey bars, impromptu gymnastics, and much more. Kids often bear forces greater than or equal to their body weight during these types of activities, and it’s taken as conventional wisdom that it’s good for them to do so and helpful to the development of a healthy body and lifestyle. However, some people still shrink from the image of a kid hefting dumbbells or working out on a cable machine. As sedentary lifestyles become more widespread in our culture, it’s especially important to help kids to be active and to engage in the kinds of activities that encourage lifelong health. Current recommendations from the National Association for Sport and Physical Education (NASPE) and others state that kids should get in a minimum of one hour of structured exercise and up to several hours of physical activity each day. Structured strength training for kids can and should be a big part of that, granted that proper supervision is available. Common sense holds in this situation: obviously kids shouldn’t lift extreme loads or put themselves through the volume of training an adult bodybuilder would, for example. If certain guidelines specific to weight training for kids are followed, according to the American Council on Exercise (ACE), resistance training is healthy and safe for kids as soon as they are able to accept and follow directions, usually around the age of seven or eight. Certain variables in strength training programs are the same for kids as for adults, but there are key differences. NSCA notes that there have been no reported injuries in any well-designed scientific studies of weight training for kids. Injuries that do occur outside of structured settings are almost always due to poor technique and form, lack of supervision, and improper progression. All of these potential risks can be eliminated through education and supervision. The effectiveness of strength training for kids is also well-documented. Over 8 weeks of progressive resistance training, previously untrained kids were able to increase their strength by an impressive average of 30 to 40%. It’s important to note that gains in strength after a period of strength training seem to be due to neural adaptations, i.e., the nervous system becoming more adept at the recruitment of muscle fibers and at coordinating how muscles work together to produce efficient movement. This is true in the early training period for adult exercisers as well. Increases in nervous system adaptations in strength training programs for kids have the additional benefit of enhancing balance, proprioception, posture (https://www.askthetrainer.com/posture-problems/), and more, all of which further helps to prevent injury while building confidence, helping set kids up for a lifetime of health. The most important things to keep in mind when structuring strength training for kids are safety and fun. First, the workouts must be properly instructed, well-supervised, and intelligently progressed. If you are a parent considering introducing your child to strength training, make sure you understand the basics of strength training yourself. Better yet, book some sessions with a qualified personal trainer who can help you and your child develop a well-thought out kid’s strength training program. Even if you are already well-versed in weight lifting, remember that children’s bodies differ from adults in key physiological ways. For a primer on the physiological differences between kids and adults, read the section below on guidelines for kid’s strength training programs. Second, the workouts must be fun and interesting to hold kids’ ever-shifting attention. Otherwise, poor adherence and effort will prevent kids from being able to receive the many benefits of strength training described above. Most kids are not going to show the same dedication to weight training for its own sake that an adult would be able to. Some kids are very focused while others will need extra guidance and attention. If you’re struggling to keep the attention on the task at hand, find ways to make strength training feel like a game. Use music, set up stations, give exercises funny names, and/or have kids exercise in groups. Most kids love learning new things and enhancing their feeling of mastery of various tasks, so include a variety of easy exercises to keep kids motivated. Whether the exerciser in question is a kid or an adult, it’s best to have a fitness assessment performed prior to beginning strength training. The fitness assessment should include a movement assessment. The purpose of a movement assessment is to identify any postural issues or suboptimal movement patterns that may halt a child’s progress or predispose a child to injury. A movement assessment can be performed by a trained fitness professional such as an NASM-certified personal trainer. The trainer will have the child perform basic exercises while assessing key physical checkpoints. The trainer can then identify which muscles are tight and which are elongated to design an individualized program to correct the muscle imbalances (https://www.askthetrainer.com/hunch-back-posture-problems/). Nipping postural issues in the bud and teaching good exercise habits during childhood can be extremely helpful in preventing physical problems down the road. Overall, strength training for kids should focus primarily on stability and endurance. Adolescents who have mastered stability and endurance can move on to hypertrophy, maximal strength, and power training, but younger kids should stick with stability-endurance level exercises. Any workout, for a child or an adult, should be preceded by a cardiovascular/flexibility warm up and ended with a cool down period, which mirrors the warm up process. Now, this is probably obvious, but strength training should be a part of a kid’s exercise program, but not the only type of exercise used. Cardio exercise is also key to youth fitness: include activities such as walking, jogging, running, sports, and water play alongside resistance training. Many gyms and fitness facilities offer group strength training programs for kids. Due to its focus on youth development, your local YMCA is a great place to find kid’s strength training classes. Many personal trainers at YMCAs and other gyms also have experience working with young clients and can help you and your child develop a safe and effective kid’s weight training program. Keep in mind that most gyms require adult supervision at all times for kids under 13, so as a parent, you will need to devote considerable time and attention if your child under 13 begins a strength training program. Most strength training exercises appropriate for beginning adult exercisers are also appropriate for kids. This includes core exercises, full-body exercises, lower body exercises, and upper body exercises. Strength training exercises for kids can be performed on the floor with no equipment, using a stability ball or BOSU ball, with medicine balls, with cable machines and resistance bands, using dumbbells and barbells, and combinations of the above. Bodyweight exercises and full-body exercises tend to be great for kids because of their focus on core strength, posture control, and developing efficient dynamic movement. These types of exercises also work large muscle groups, which helps burn lots of calories. Classic push-ups are a great upper body exercise for kids and adults that also help to build core strength. The lunge (https://www.askthetrainer.com/lunge-exercise/) is another classic exercise with many variations that should be a staple of everyone’s exercise plan. A great combo exercise to use in a kid’s strength training program is the dumbbell step-up with shoulder press. This combination exercise improves coordination while strengthening the lower body and the shoulders in one compound movement. Visit our comprehensive exercise video library to get ideas for strength training exercises for kids. Pay close attention to instructions on form and technique: these are just as important for kids as for adults. Remember to start slow and simple and progress slowly. 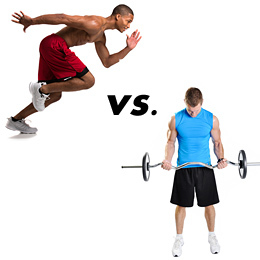 The emphasis should always be on efficient, coordinated movement and postural control rather than moving heavy weight. Feel free to contact the author if you have any questions on whether or not a specific exercise is best to include in kid’s strength training program. 2. Clark, M.A., Lucett, S.C., and Sutton, B.G., (Eds.). (2012). Chronic health conditions and physical or functional limitations. NASM essentials of personal fitness training. Philadelphia: Lippincott Williams & Wilkins. 3. Faigenbaum, A.D., et al. (2009). Youth resistance training: An updated position statement paper from the National Strength and Conditioning Association. Journal of Strength and Conditioning Research, 23(5): 60-79. 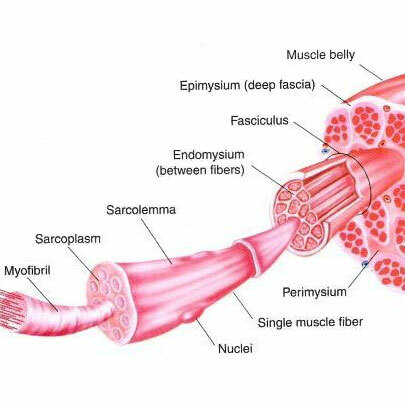 Myofibrillar vs. Sarcoplasmic Hypertrophy: Think Small to Get Big!